The schedule for Star Parties and Special Events will be posted on the calendar. For those new to amateur astronomy, a description of a star party is listed in the next section. Star Party cancellations will be very rare. When cloudy, a virtual Star Party will usually take place indoors to include overviews of the sky for that night using computer simulations, videos of interesting sky events recorded previously, demonstrations and/or training on the use of scopes and other equipment, and discussions. Sometimes a solid forecast for snow, rain or high wind will result in cancellation of a given Star Party. If in doubt about the weather, call 508-398-4765 during the event — no answer means the event has been cancelled. Cancellations may also be reflected on the calendar. Special events will be planned at the observatory: for example, we may meet to observe an occultation of a star by an asteroid, observe a star’s variability, watch a partial eclipse of the sun or observe a Nova. The lower level of the observatory is called the warm room and is heated. Up in the Dome room there is no heat and it has the same temperature as outside — it will be cold during the winter season. Dress warmly. No fees or applications; just come and enjoy the night sky! If you wish to schedule a Star Party for your group, please contact us. Staff is limited and we may not be able to fill everyone’s requests, if you are interested in volunteering, please contact us. Observatory staff members, who are experienced amateur astronomers having knowledge of the night sky and our equipment, open the observatory to guests for two to three hours. If it is clear, visitors have supervised access to the big permanently mounted 16″ (diameter) telescope upstairs in our Dome and we may have as many as four other telescopes out on the lawn. Sometimes visitors bring their own telescopes or binoculars. We look at all things in the sky from constellations to the moon and planets and far beyond. We even have daytime “Local Star Parties” where the “star” is our sun and we view it and its phenomena using special solar telescopes. When guests arrive, one-on-one conversations start with staff members — inside or outside. Those discussions usually lead to moving to one of our scopes where we begin to look at and discuss targets in the sky which fit with the interests and sky gazing experience of guests. From September thru June, we will have one regularly scheduled Star Party each month on the Saturday each month closest to the date of First Quarter Moon (about 7 days old) each month. When the moon is near its First Quarter, the terminator (the line dividing light from dark) is favorable for viewing sunlight or shadow on the sides of craters. This time is also favorable for observing the dark side of the moon occult (cover) stars in the sky beyond it as the moon moves in its orbit. They are members of the Society and anyone wishing to visit; now and then, an experienced amateur astronomer or even a professional or professor. 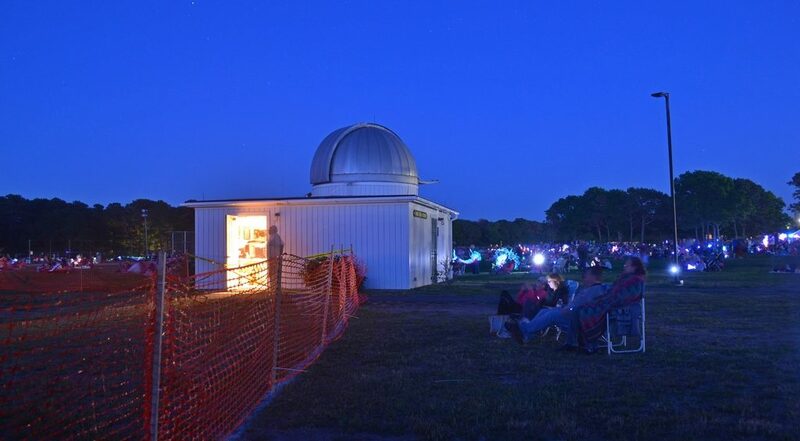 More commonly though, it is folks who learned, “Hey, there is an astronomical observatory at the Dennis-Yarmouth Regional High School… let’s go check it out.” We do great with kids over about 5 years old if they are shepherded reasonably by accompanying adults. There is nothing more fun for Staff Members than the big “Wow!” we’ll get from a youngster the first time he (or even “older” folks) sees a crater on the moon or the rings of Saturn. On a typical night we might have fifteen visitors made up of perhaps two families with or without children; one or more high school age kids, and several older individuals. If folks are new to the night sky we will usually start looking at constellations (e.g, Ursa Major or its commonly known asterism, “The Big Dipper”), point to specific bright stars with a laser pointer, and then look through one of our ‘scopes at whatever might be fun in a given constellation. For the more knowledgeable and experienced, we might search for and observe distant planets like Neptune, nebulae, star clusters, and distant galaxies. Everyone enjoys Jupiter and its moons or Saturn and its rings and moons! We have lots to show and do inside when it’s cloudy including simulating looking at the night sky: we can mimic almost exactly the experience of looking at the sky with the naked-eye, then binoculars, then more powerful telescopes using a very good night-sky simulation program with the “viewing” showing up on a big flat screen TV. We can also look at videos of special sights and observing projects from previous observing nights or browse interesting astronomy material on the web. Try this: a senior member of our Observatory Staff is Director of Research at our facility. In recent months he has collected brightness variation for the light we can measure as an asteroid passes in front of a star; the variation in the light measured over several seconds can shed light on the structure of the asteroid. That’s research! We look forward to seeing you at our next Star Party or Event!